Happy 4th of July! Yesterday I ran 3 miles and for the first time, my pace for each mile was under 12 minutes. The picture isn’t the best, but my speed is improving! I’m always joking that I run like a turtle, but it’s so exciting to see my speed improving. I don’t know how much faster I’ll be able to go, but I’ve always wanted to be able to run at a 10-minute pace, so perhaps that goal is attainable for me! It’s going to be a nice day today (and then rain for the rest of the weekend), so as soon as I post this blog, I’m headed off for a run with hills, and then off to the grocery store because the cupboards are bare after being on vacation! After that, my husband and I are going to spend the rest of the day outside in the backyard, grilling, and sitting around the fire pit later in the evening! It should be a nice, relaxing day! I hope that today is a fun, relaxing day for you as well! Congrats – such a cool feeling to know that you are getting faster! What device are you wearing? Is it something that times each mile? 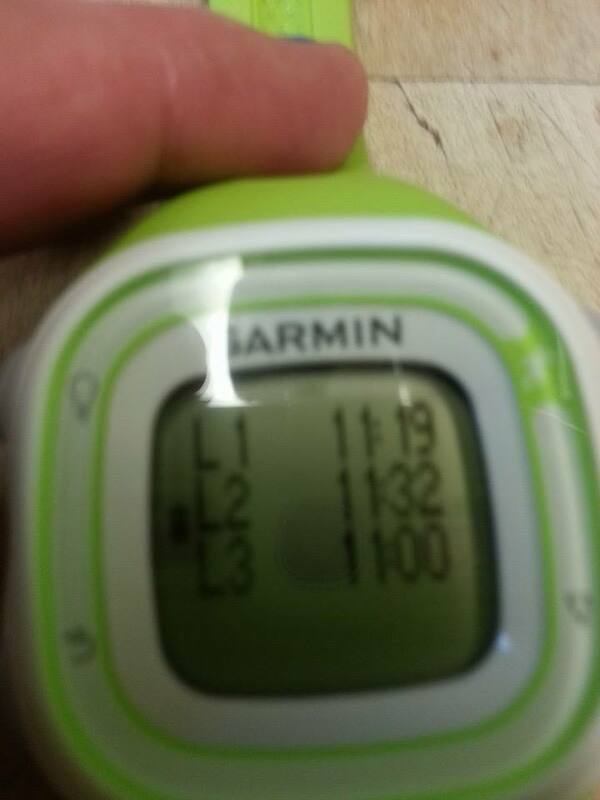 The watch I wear is a Garmin Forerunner 10. It keeps track of my mileage, time, pace, and calories burned on my runs. It will also tell me how fast I ran each mile. Such an easy device to use; my only complaint is that sometimes it takes FOREVER for the GPS to find my location. I have the same problem with my 210. Sometimes I stand out there looking ridiculous staring at my wrist for up to 15 minutes. I’m hoping to get the 220 next payday. I’ve heard nothing but good things about that one!